Getting students to create personal narratives that are engaging and focused is one of the biggest challenges I face in writing. I've been using the Lucy Calkin's Units of Study for a few years now. 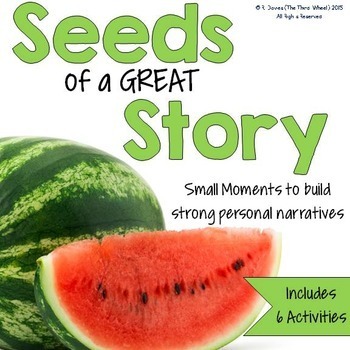 One of my favorite parts is the analogy watermelons and seeds during the idea generation process for personal narrative writing. I've found my students really love to tell their stories, but they want to tell everything from the moment they got in the car to drive to the airport to the exact second they hopped into bed after returning from their trip. In other words, their stories turn into long…or really short…lists rather than giving the reader a deeper look into their experience. My solution has been to go more in depth on this important analogy. Personal narratives should be filled with emotion and the reader should be able to feel like they are there with the author. However, when students focus on a large event, they don't give these descriptive details because most of them just want to get the story out…and it is a long story! I can't tell you how many times I've gotten the story that goes from the moment they got in the car to go to Grandma's house until the moment they got out of the car when they returned…and 10 pages of writing later, it isn't at all engaging. Focusing Personal Narratives – Start from the beginning. I try to work in a number of engaging activities that work through the gradual release model. First, I provide models and we work to sort them. Next, students generate their own examples and non-examples. Finally, we start moving into the process of picking an idea and focusing our topic into a specific small moment. It takes some time, and I try to give tons of models from my own life. However, within this first round of lessons about 80% of my kids really get the idea and start producing focused small moment writing. The other 20% typically need a little more one-on-one support to really get there, but they definitely make significant gains. Here is a sample of one of the first activities we do to help my students generate ideas for personal narratives. This activity has them sorting examples and non-examples. They are given the ideas, and we discuss as a class. Students color-code the ideas as we work through them together. Then they cut and paste them into the correct category. I have a similar sort that they complete independently after we do this model together. I also put a card sort that is similar into my language arts centers to help give students extra practice. The next step from here is having students take a blank organizer and generate 3 ideas that are watermelons and identify seeds within each. I have a graphic organizer to help them with this, and it really seems to help. Finally, from there we move on to actually starting to pick an idea and lay out their personal narratives (which is a completely different process). I've discovered that this process really changes the tone of my writing classroom for the rest of the year. Any time I ask the students to write about a personal experience, they are much more focused and discussing the deeper pieces of the event instead of just giving the play-by-play. It also helps us build a shared vocabulary as we move forward. Want your own copy of some of the materials I use for these lessons? Enter your email below for a free personal narrative mini-pack! Tired of getting personal narratives that just ramble on? Stop boring narratives with these free, easy-to-implement activities that will have your students writing like pros in no time! Awesome! Go check your email to confirm and get your free personal narrative writing mini-pack. I hope this article gave you some ideas for helping your writers focus their personal narratives. If you’d like more ideas from The Third Wheel, be sure to follow me on Teachers Pay Teachers, Facebook, Pinterest, and Instagram to keep up to date and on the latest tips, tools, and freebies for your classroom. I Love Lucy's writing. This worksheet will be a great help. I am using Lucy Calkins too! Thanks for sharing! Great worksheet! Love this..and we use LC too! Watermelon vs Seed stories was hard for my kids last year. I think this will help! Thank you for sharing! Your watermelon sheet is too cute. I'm unfamiliar with LC, but your presentation can certainly help with kiddos narrowing their ideas. I absolutely LOVE this seed writing paper your created. Thank you so much for sharing it! Last year was my first year using Lucky and I have to admit I struggled with all the wording in the lessons. I'm hoping to find other teachers and bloggers who can provide neat things like this to help me teach it better this year. Thanks! Love this organizer. We use UoS as well and this will be my first year in 3rd so I am excited to have this to use. (tear) I can't get the cute title to download correctly, but thanks for posting!! I teach 4th grade, and we're using it this year for the first time, too. I think the watermelon paper is great! I've tried out the writer's workshop before and can honestly say more of my kids enjoyed writing than with other ways I've taught it, but it's hard to figure out exactly what to teach, I think. I'm hoping her books will help with this. And I think when you're thinking about how wordy she is, remember this – you want to get the point across, but you can do it in your own way. We also have less time for writing than she calls for, so we're going to do each session in 2 days, using the mid lesson teaching point as a minilesson to start off the next day. We'll see how it goes! I love the Units of Study, but I also love spicing it up! Thanks for sharing this. One thing I would add about Lucy's work is that all of that wording is just the way ONE teacher made it work in her classroom. If you focus on the bold print in the text and make it work for you, you'll be much happier. 🙂 Good luck this school year! I just stumbled upon your blog when looking for resources for seed story lessons, and I love your handout! I can't seem to download it though. Can you email it to me instead? Thank you! I love Lucy Calkins, also and I LOVE this graphic organizer!!! Thanks for sharing it! Would you be so kind as to email it to me, as well? THANK YOU SO MUCH!!! Crud! I had it linked…must have gotten messed up when I put the link to Amazon in just a minute ago. Off to fix the problem! Just found your blog. We are going to be using Lucy Calkins this year. Is there any way I can get a copy of the Seed Writing sheet? Thanks! Just enter your email on the post, and it will arrive right to your inbox. Is it still possible to get a copy of this Small Moments seed organizer sheet? Yes! Just add your email into the form at the bottom of the post, and it will come right to your inbox. Where can I find the handout regarding “Generating Small Moments”? I would love a copy of this organizer!